Do you have trouble finding people in your WeChat contact list? Do you know a bunch of people with the same first name? Can you not differentiate the Jessica from work from the Jessica from salsa class from the Jessica who’s a friend of a friend? Do you forget who’s who once your contact changes their profile picture into motivational quotes, childhood photos, and pictures of cute animals? Can you not find your Chinese contact’s Chinese name no matter how many times you scroll through your contact list? If you answered “yes” to even one of the above questions, you need to reorganize your contact list! By categorizing your contacts, you’ll save time in looking for contacts and avoid sending messages to the wrong person (which I’ve done, regretfully). Click on your contact’s information page, tap the three vertical dots on the top right corner, and select “Set Remarks and Tags”. 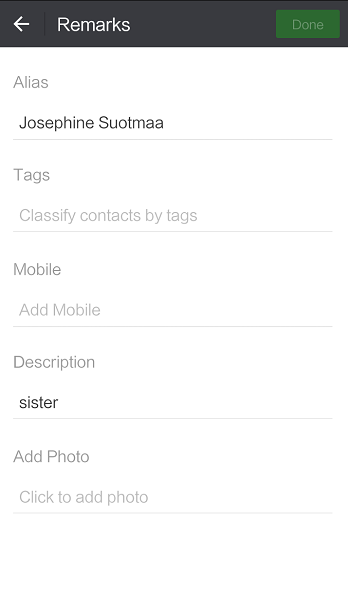 Once you’ve changed your contact’s alias, you can add tags, the real “categorizer”. 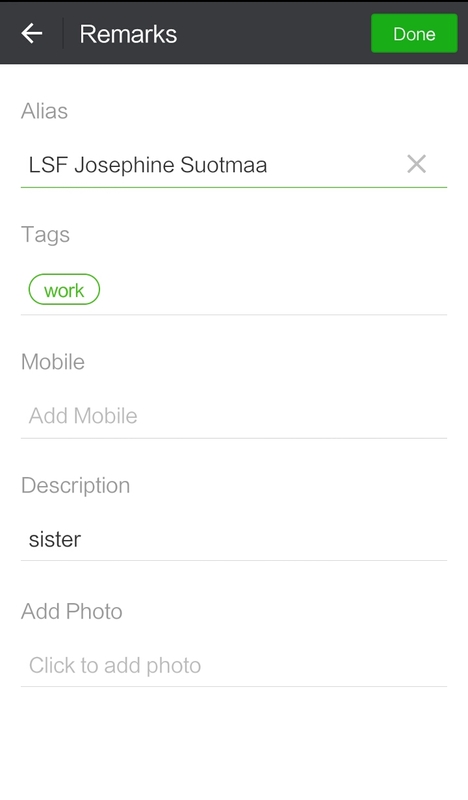 The tag you assign a contact is more important for managing your WeChat privacy than for organizing your contacts since you likely only need one method of organizing (in this case, labeling using the alias). 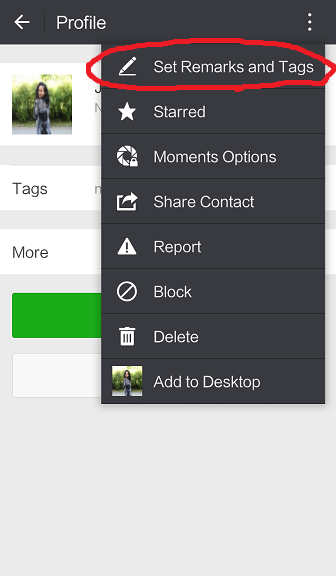 WeChat also allows you to “star” your favorite contacts at the top of your contact list to keep them “sticky on top”. Here, you’ll see that I’ve added a mobile phone number (really useful if you change phones often, or if your phone ever dies and you need to find a contact number). I usually add work contact numbers to their wechat ID so that I can see their faces when I’m trying to find them in a crowd. I’ve also added a description, “husband”, and a photo of him to remind me what he looks like (just in case I forget). This function is very useful if your contact doesn’t ever put their face in their profile picture. You can also use the photo attachment feature to organize business cards. Just take a photo of it, and attach it to the wechat contact. Note: takes up memory. 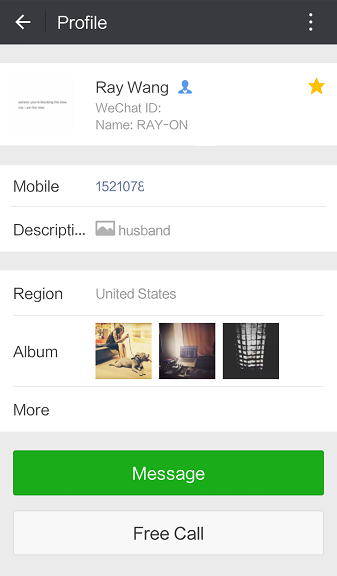 How you categorize and organize your WeChat contacts depends entirely on your style and preference. I use one WeChat account for everything from private, family conversations to work related things, preferring to keep it all in one place. 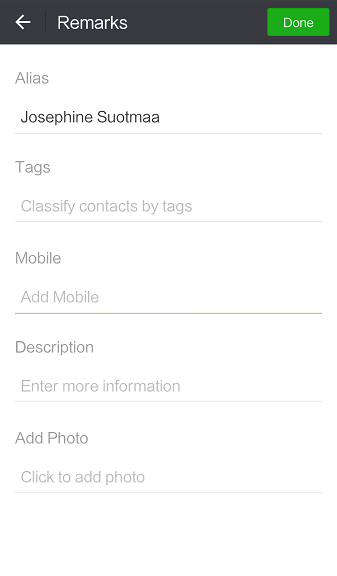 As such, categorizing contacts is especially important for me. I also like to keep all related contacts together on my contact list, so as to remind me who knows who from where. For example, a group of people might’ve all worked at one company, but now work elsewhere, but I might not change their company name because I prefer to remember that they all know each other very well. With names, it’s just confusing when everyone has the same name, and I’ve never been good at remembering last names unless I’ve signed up coworkers for something. I have a popular name (Jessica), so I remember what it was like sitting in class and having a Jessica S., a Jessica R., a Jessica T., a Jessica Y…if I didn’t see them every day, I might not remember who each of them are! Sometimes, I might just delete their on screen name entirely and type in my own version of their name. The reason is that special characters (such as flags, flowers, palm trees…), Chinese characters (I’m illiterate), and cute emoticons at the front of their name will put them somewhere unpredictable in my contact list. Chinese characters are the most random for me, and I don’t want to spend up to ten minutes scrolling through hundreds of contacts only to miss it because I’m not sure which set of Chinese characters is the one I’m looking for. The special characters will send your contact to the bottom of your list, but then you have to remember who’s at the bottom rather than just select the alphabet corresponding to their name. Now, all I have to do is remember where everyone works at, and it’s easy to find coworkers and contacts. Next time someone asks “Do you know anyone at XYZ company?” You can easily check. Hope that was helpful! How do you categorize your contact list? Share whats worked for you! I had one question left: how can I change the profile picture of a contact? I don’t want to have their photo as profile, I want to chose it myself. Is this possible? At the moment, it’s not possible.